We have already introduced to you Melbourne and the Great Ocean Road, the Grand Prix of Australia and Sydney. But the Green Continent, of course, interesting not only because large cities. Unity with nature — that is Australia. So we went further on Phillip Island. Phillip Island — the island, located about 140 kilometers and two hours drive south of Melbourne. It is a natural national park and one of the most visited places in Australia. And he became famous for two things. 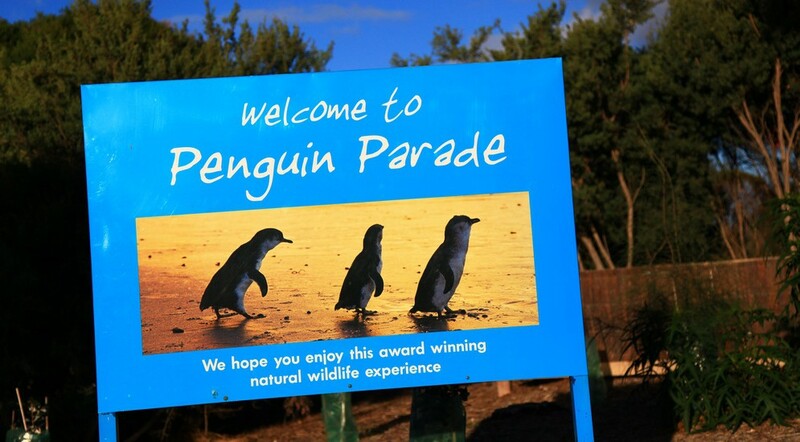 Firstly, thanks to a unique phenomenon, already known to the whole world — Penguin Parade. On the beach, Summerland, after the sun slips below the horizon and begins the twilight, which is about 8 o’clock in the evening, hundreds of the world's smallest penguins come out of the ocean to the shore.At the water's edge, they gather in small flocks of 10-50 individuals, and, as if on command, begin to waddle march "penguin walk" across the beach to their burrows. What is most unusual, it happens every day. Indeed virtually the same time! Entrance to the Penguin Parade — paid and photographing babies is prohibited. Because they return home in the dark, and the audience included the flash on the camera, which frightened them and blinded. The ban on the flash did not work, and eventually just banned the photo itself. Second, what the island is famous for — is, of course, the race track! If the majority of tourists come to the island Phillip solely for the penguins, we know that there is the famous Autodromo "Phillip Island" — one of the oldest and most exciting race tracks in autosport history, which hears the roar of engines from the 1920s! However, the stationary highway was built much later, in the 1950s. Now there are regularly held race MotoGP World Championship and Superbike, and the local ring and karting competitions. Since the island a lot of interesting things, recommend coming here is not just an overnight stay, but did a few days. You can stay, for example, in the town of Cowes. The tourist center, you can take a map of the island and find all the information you need.And, most importantly, the city is full of motels (from English «motor hotel») — hotels, providing car parking directly outside your room or in the walking distance, which is very convenient for car travelers.Most of them are not intended to include breakfast in the room rate, but there are supermarkets in the city, and motels — barbecue area. By the way, a barbecue in Australia is a very popular way of spending time — just like kebab trips in Russia. 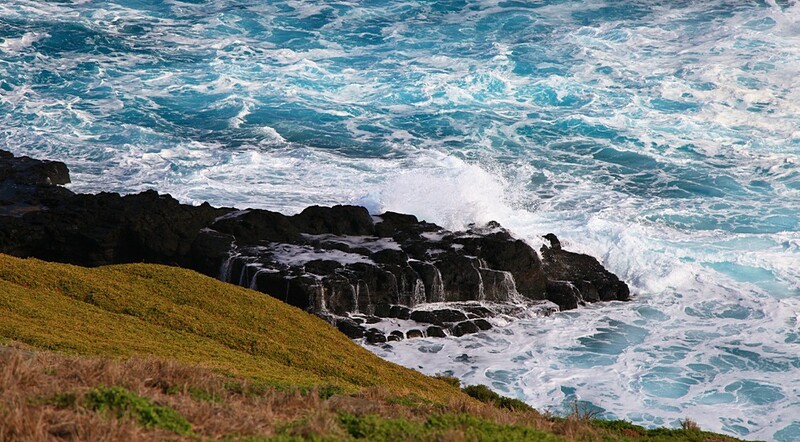 On the south-western tip of Phillip Island are the majestic cliffs Nobbys (Nobbies). There are hiking trails and viewing platforms from which you can admire not only breathtaking views of the ocean. Nearby is the island called Seal Rocks, where dwells the largest colony of Australian fur seals.You can try to look at them through binoculars, which are along the paths, but it is better to take advantage of an excursion on the boat just out of town Cowes. So you take a pleasant boat ride, and the boat will drive you directly to the animals! Famous Australian signs in the spirit of "Kangaroo: the next 10 kilometers," we came across during our travels always, as soon as we drove away from the big city for a hundred kilometers.Local warned: "Be careful with the kangaroos in the dark." And not only with a kangaroo. Almost anywhere, especially on deserted highways, large animalscan run acrossthe roads (or even crawl snakes! ), which are mainly nocturnal. We went during the day and in the wild they are not met. Before Phillip Island. Ironically, the "talking" signs were not, and kangaroo — was. And on the way from Nobbysto the beach Summerland — everywhere. Good thing not on the road, on the roadside, in the fields.Some of them are going about their business, some curiously watched us, but close to him did not let. Yes, and we ourselves were afraid. While the temptation to go out and to come closer totake pictures, always great. 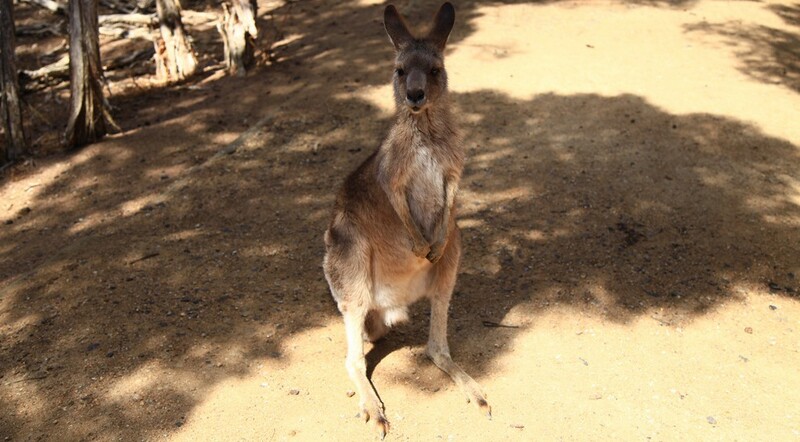 Kinds of the kangaroo family a lot and differ from one another they are primarily by size. Those that met us on the road are small and called wallabies. See on large kangaroo can be in any specialized wildlife park, which is on an island a lot.Despite the fact that the animals in public parks are safe, it was hard to force myself not to run away, seeing jumping our way large kangaroo. Massive, bright, high (if become straight will be the size of an adult man! ), they are used to that there are always guests with delicious food (special food is given, together with the entrance ticket), and strongly beg it. However, the Australians are distinguished not only extraordinary road signs, but also unusual automobile numbers. They are colorful, usually contain the name of the state (or territory) and slogan state, and sometimes a certain image as a logo. For example, the State of Victoria: «Garden state», «The place to be» and «On the move». It is interesting that in Australia, as in many other countries, the car plates are sold officially. There are special sites where you can choose your own design, symbols / numbers and reserve the number.The choice is great and the price can vary widely. For example, one can create a combination of three symbols and two or three digits, expensive — indicate the number of three to six symbols only, or only digits etc. 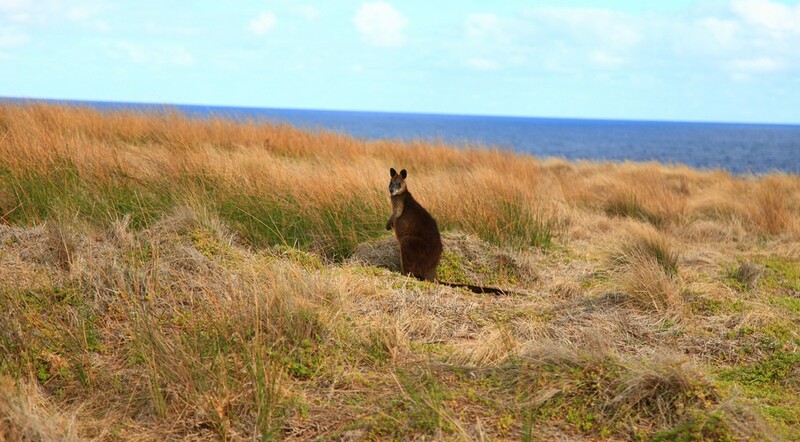 Exactly at Phillip Island we have finally discerned another main attraction in Australia. Here on the island, where there is no a bright night light megacities and avenues, clearly seen starry sky and the Southern Cross — a constellation of the southern hemisphere, the smallest area constellation in the sky!On the territory of Russia it is, as you know, is not visible. So be sure to look for the Southern Cross, when you're in Australia! Four bright stars form easily recognizable asterism, which helps in navigation, fulfilling a role similar to the North Star in the northern hemisphere — the Southern Cross to find the South.According to medieval legend, the first human ancestors, Adam and Eve saw the stars forming the Southern Cross from the Earthly Paradise, until they were cast out from it. Initially, the Southern Cross was part of the Centauri, but in 1679 it have identified as a separate constellation. Five bright stars of the Southern Cross are present on the flags of Australia, New Zealand, Papua New Guinea and Samoa. The car is — the smartest way to travel around the country. Despite the huge territory and low population density, Australia, according to some information is the second country in the world in the number of vehicles per capita and has a length of roads per person is 3-4 times higher than in European countries. Intercity land transport, of course, there is, but essentially loses machines. There are lots of places where except on your car you just will not reach. And there are places where it is pleasant to walk. For example, to wander through the endless paths, piercing Island Park Phillip Island. While maintaining wilderness of the nature paths are perfectly equipped: in the thickets looming signs indicating directions and distances, strictly delineated picnic areas. And ahead — new countries and new car travel!